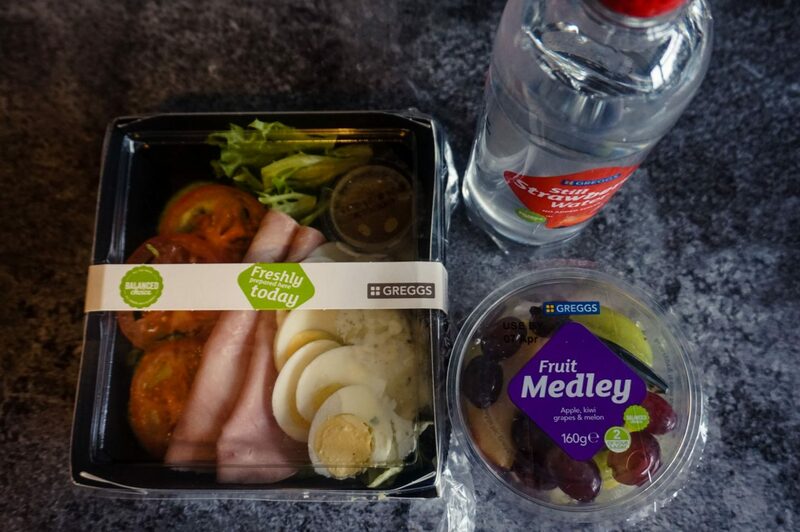 Greggs Balanced Choice Range Review - is it as good as it sounds? Is it just me, or is buying breakfast or lunch whilst you’re out, a bit of a treat? You’ll perhaps swing in to grab your cup of morning filter, get tempted by whatever pastries are on offer, resist and decide that it’s not worth the calories or the cash. I mean they never offer anything actually healthy – right? I never really thought places that sell my morning coffee could offer me more than a croissant, and as for lunch, probably your billy basics like a simple cheese and ham toastie. Not exactly the most nutritious aids for your daily needs and certainly no way near filling! So why are we talking about breakfasts and lunches in our local coffee shops and food on the go places? Well, I quite possibly had the best mystery shop style collaboration ever, and I’m here to tell you my foodie findings! 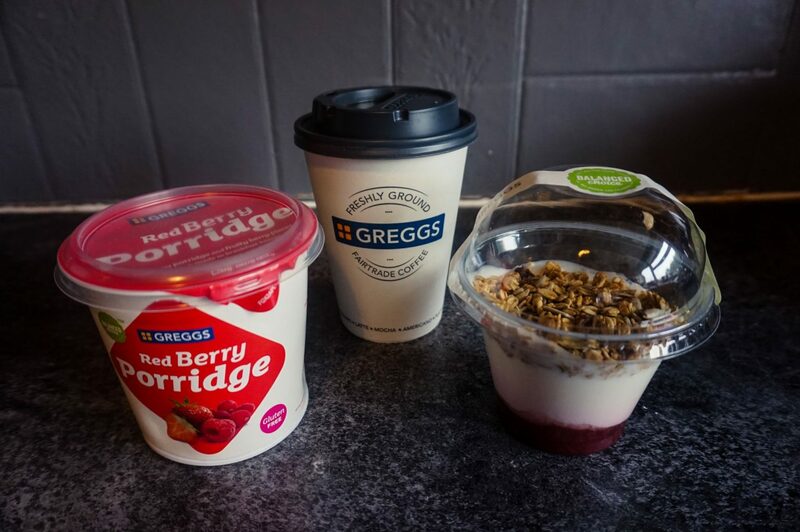 I was tasked to try out both breakfasts and lunches at a number of mainstream coffee shop and food shop chains, and then and compare them to that of Greggs. What was good, what wasn’t and so on. But why was I to do this test? 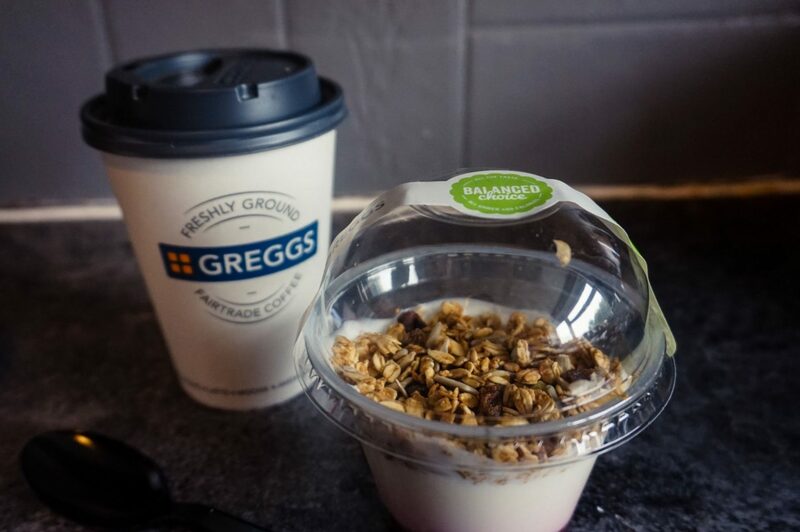 Greggs have actually partnered with Public Health England on their One You campaign after studies revealed that on average we’re eating an extra 200-300 calories a day! Which built up over time is quite an amount, and also a big factor in the current obesity crisis in the UK. It is so easy to add the calories on if you’re not careful, something I learnt with this campaign. Obviously, people do go out and they do eat on a regular basis in coffee shops, but the scary thing is, they’re not really taking much care in choosing the healthiest option. Maybe it’s just me, but I’ll always look at calories, then sugar and salt content, even with a coffee! I never order lattes, or coffees with cream and syrups, because I’ll be drinking my daily calories away when I’d rather have something far more substantial. 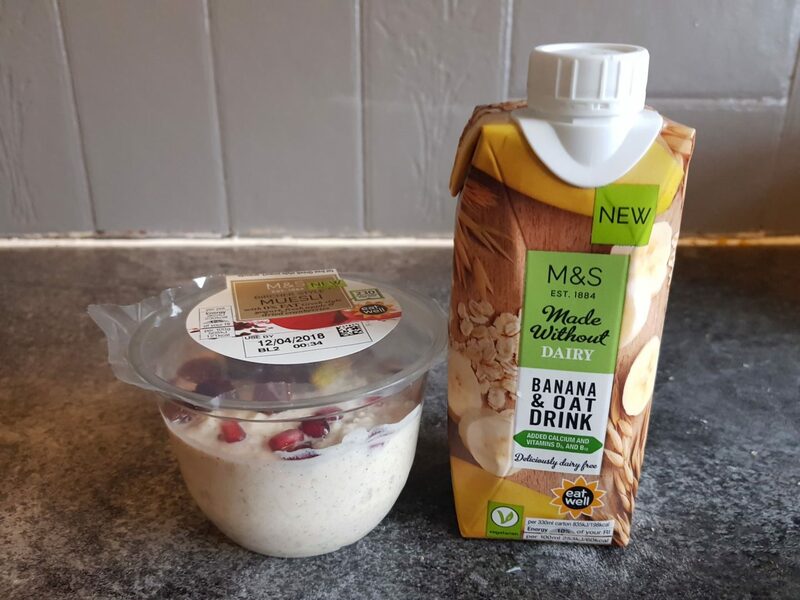 As I mentioned before, a lot of coffee shops and places you can buy convenience foods for ‘on-the-go’, give very limited healthy options, and if they do, it often comes with a price tag. So, onto my task, I was really excited to get stuck into this campaign, because I truly believe in this day and age, people need to be aware of their calorie intake, being healthy and it should be these food-to-go places job to help us. I was going to be judging Costa, Nero, M&S, Tesco and of course Greggs, all to see what each of these retailers’ food-to-go options were like. I was given a budget for each of £15 a day to cover both breakfast and lunch and was going to be looking at the following factors for each. I decided to begin with Greggs – the one the campaign is centred around. Now before I proceed any further, I just need to clarify, I’ve not taken part in a campaign where I am obligated to say nice things about Greggs. This is, (as it is always) my own personal opinion and how I felt it was, judged on the 5 points above. I was also really interested to see what would keep me feeling fuller, less likely to snack and was something healthy. Over the past few years, Greggs has had a bit of a revamp. I used to pop into Greggs when I was first allowed to go into town as a young teen and buy my 50p sausage roll! It’s a staple brand of most towns and cities, as it has been going for over 75 years now, and if you’re not sure what you want, you know you’ll always get a quality pastry if nothing more. Greggs has changed though, and whilst it still does all of the above, it’s offering such a wide range, I was a little bit shocked by how much. They have quite a selection, especially in the Balanced Choice range. Lunch – Honey roast ham, sliced free range egg, tomato, cucumber and fresh salad leaves are accompanied by a Dijon mustard and mayonnaise potato salad 232 kcal Strawberry water 5 kcal Fruit medley 72 kcal. Very easy to find the nutritional information, as the healthy choices were clearly labelled in green and said Balanced Choices on them, meaning they were under 400kcal. Packaging was all really light and somehow made it all look nice and healthy. I had a salad for my lunch and it even said freshly prepared today, same with my granola yoghurt, so a big bonus it hadn’t been pre-packed and sold, like each other place I tried out. Often you find most places have bought in bulk from a supplier so it won’t be fresh that day. 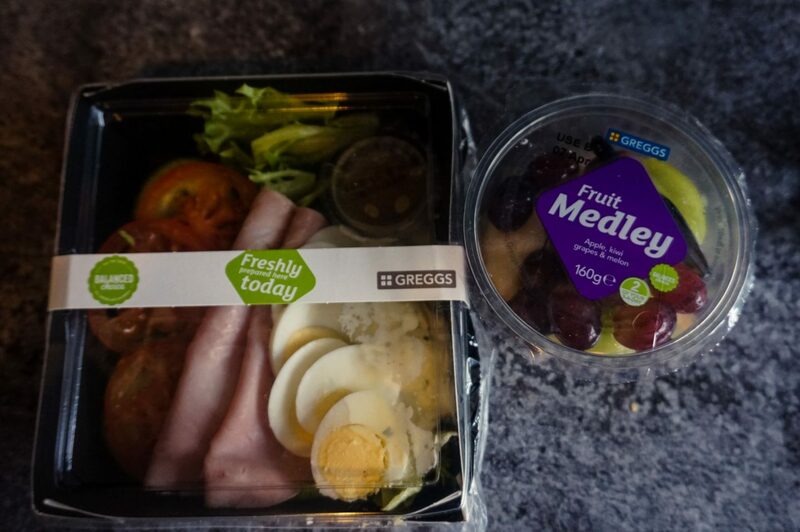 I actually tried Greggs breakfasts and lunches twice, because my allowance stretched over two days so four meals in total – the only one that allowed that! On one day I had the freshly prepared granola, but the other day I went for porridge. I had the red berry variety, which was very tasty and great to see there was also a choice of golden syrup or original. The only thing I’d of loved to have seen was some more chilled breakfast options, as you’ll still always have your Greggs classics, such as your bacon butties and pastries etc. I really liked the packaging actually, nice to very clearly see which was your healthy option, rather than trying to find what the numbers were. Value for money, this was actually by far the best out of every place I went, I still had money left over post-trial! 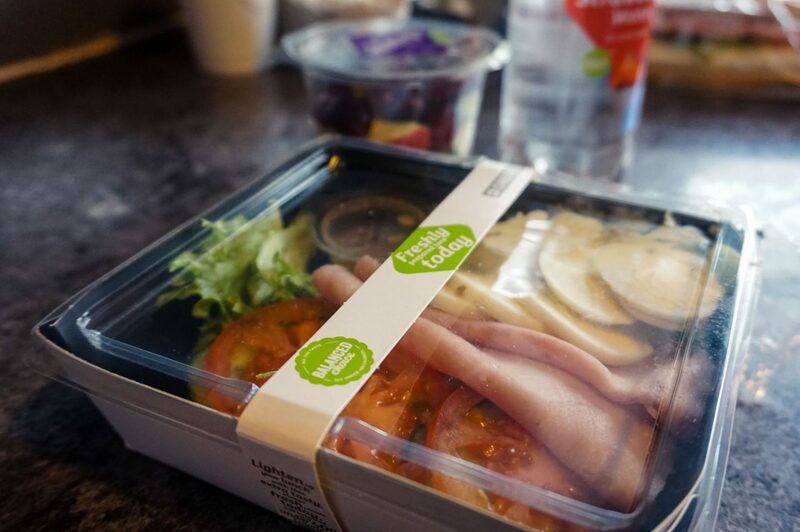 They also have a meal deal option to keep cost down too, which is on the sandwiches rather than the salads. I’m going to try this legendary tomato soup – apparently, Chris Evans raves about how good it is – so that will be used with the remainder of my money. 5/5 – value and variety won me over on this one – oh my days fantastic actually. p.s coffee is good too! 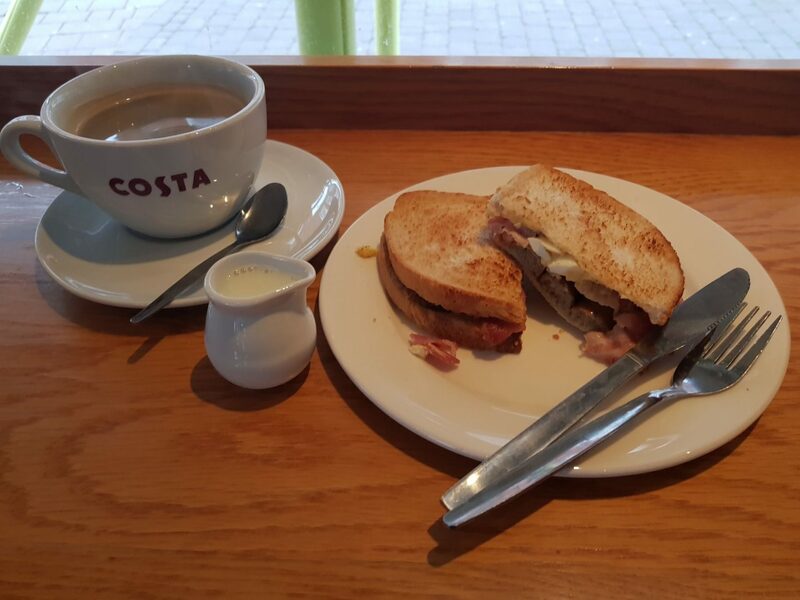 Costa coffee tends to be quite popular in my town, but I don’t often go there because it can be quite expensive, I very rarely eat here purely because I find most options are croissants or cheese-related sandwiches. Also if I’m totally honest apart from their cakes, their food options don’t particularly appeal. As much as I love those sweet treats, it doesn’t exactly help when you want to be healthy, so I don’t bother at all. Costa has a little label next to each item that tells you the nutritional content. Packaging was coffee shop standard, they all start to look the same to be honest. Quite small to read with no clear indicators as to what is healthy, they do however have a printed A4 card sign of calories of everything, if you’re really on the hunt for the best calorie savers. I was a bit disappointed not getting to have a porridge, but they had a few gaps on their shelves and this was one of them. You pay for a plain porridge then you can pay additional to add toppers, but as I say, they had none left. They don’t have a specific healthy range from what I could see, no salads, they do hot soups and pasta boxes, so I tried to go for what I thought was best. Both breakfast and lunch were tasty, but not filling. Cost wise, an Americano will always save you money in any place like this because the more fancy, (still £2.20) the more expensive. However, porridge was a bit ridiculous, it was £2.00 for a plain porridge then an extra 45p per additional toppings. I can’t say I was blown away by this eating experience, it was okay and the coffee was good. 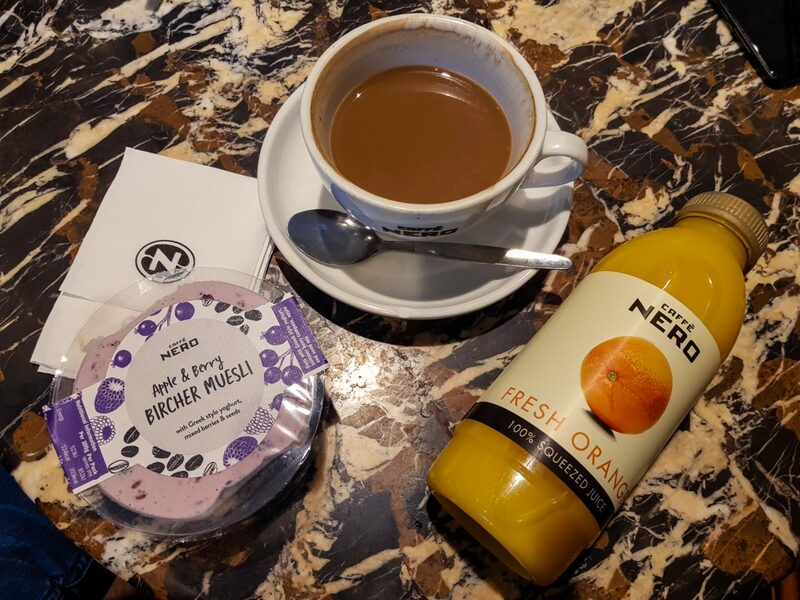 I do like Cafe Nero coffee, it has always been a firm favourite, but between a bit of slow service, (I sometimes want to order 10 minutes before I arrive) and paying extra to have fancy milk, a decaf option(! ), or to sit in with your food, it isn’t my ‘go-to’. The thing that stuck out the most for me was the selection of breakfasts available. 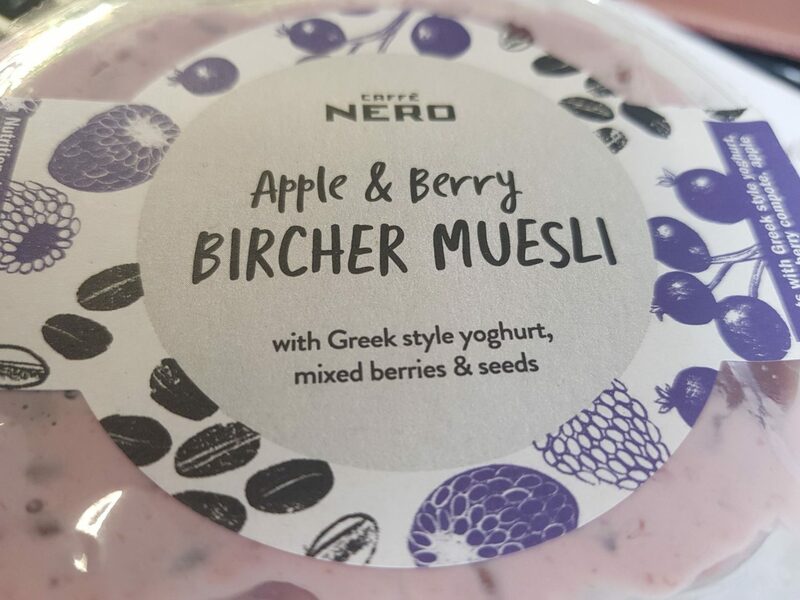 I’m a huge fan of bircher muesli, and having this an option with my morning coffee was great. However I made the mistake of sitting in rather than taking away, so I lost a bit of my budget just for a comfy seat. The lunches were mainly sandwiches with a few hot options, but nothing was labelled as being a healthy option, so I had to route through hunting for calories. Snack wise you had Metcalfe popcorn, then it was mainly chocolates and sweet treats, apart from dried mango, which we all know isn’t as healthy as you think. The food looks far more appealing here, the packaging looks good, plus they have some extra lunch options with risotto and soup, but it all looks quite rich and heavy foods. 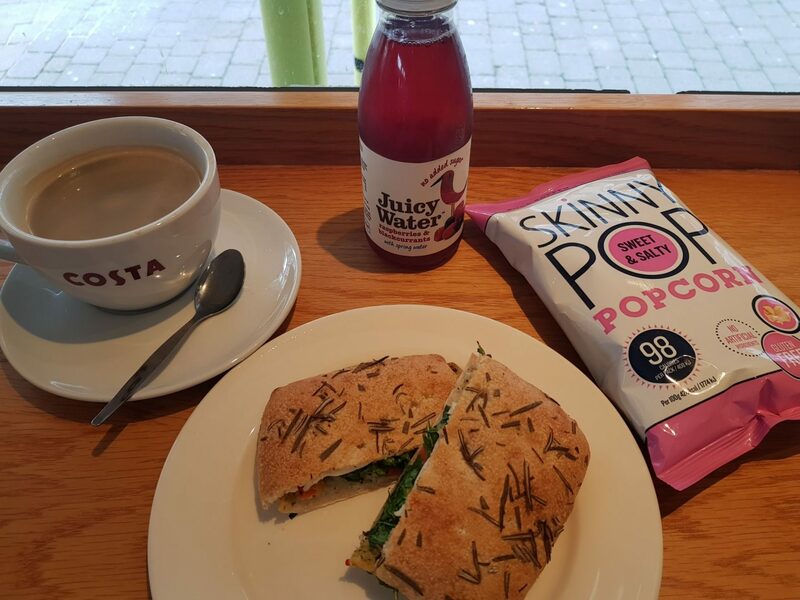 2/5 – between them breaking the fridge, having to pay an additional 10p per item to eat in, and the crazy amount of calories (even when trying to find healthy options)… I’d maybe skip next time for lunch – but maybe I’d go back for the muesli and coffee! 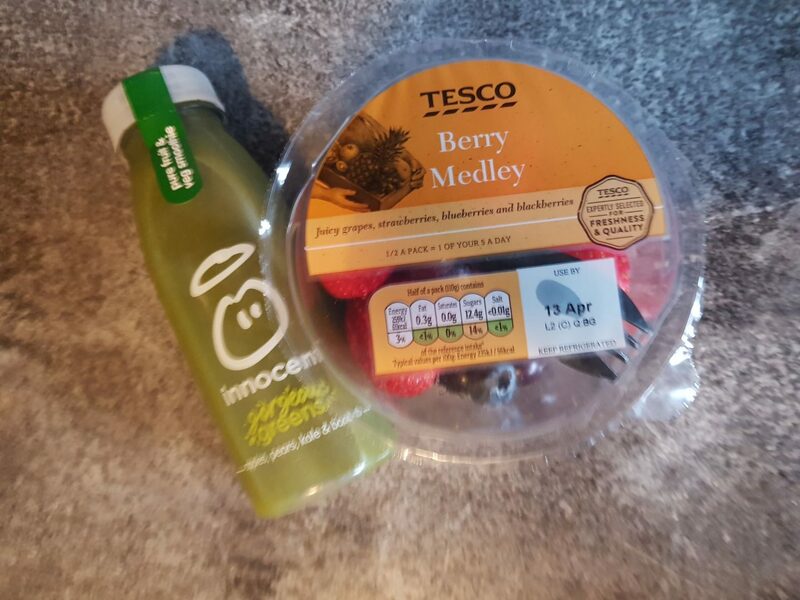 Tesco has a £3 meal deal which is nice and tempting for lunches, but breakfast? You are very limited. It is basically fruit or a smoothie. They do offer some hot options but you’re looking at pastries and nothing of any healthy sort. 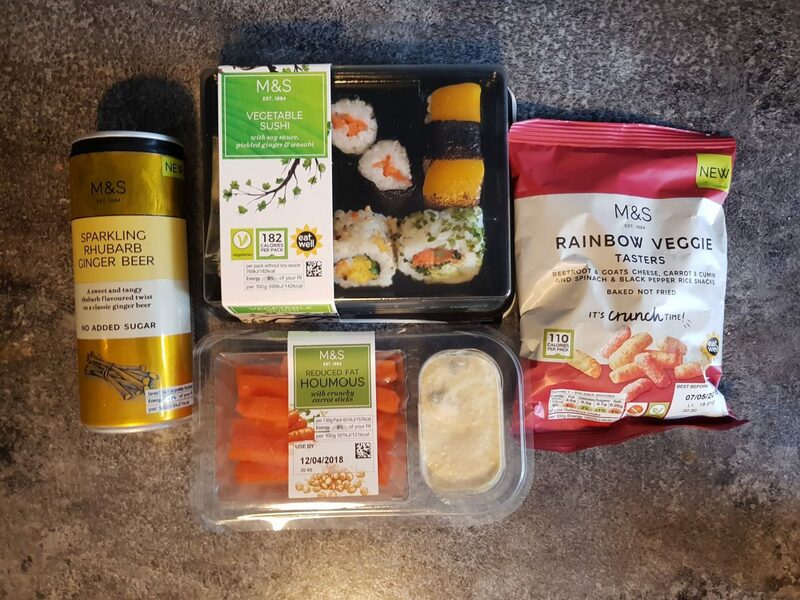 Lunch-wise, as I say, you have the £3 meal deal and Tesco is pretty switched on with healthy options with the Healthy Living items with their specific packaging. 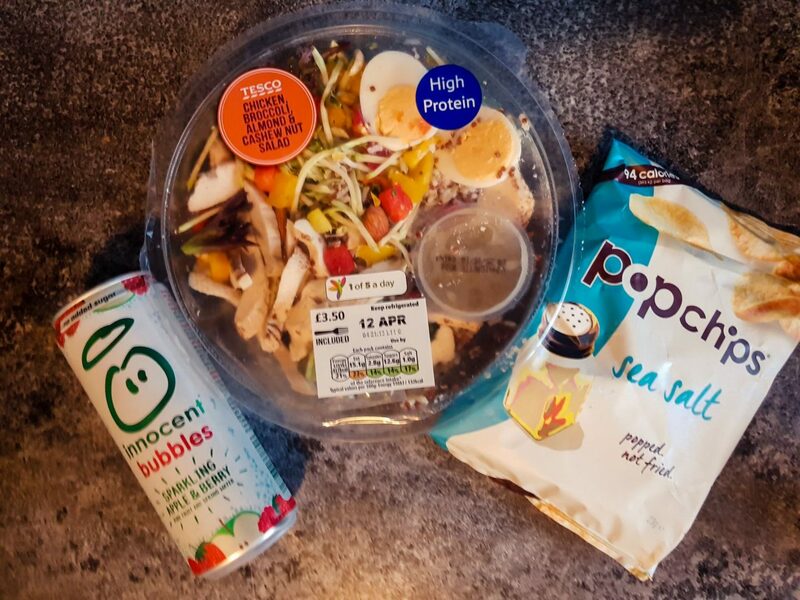 You have salads and sandwiches to select from, and you can keep it quite low with your calories, but unless you select Tesco own brand products, you may struggle with things like sugar content. Mostly disappointed by the lack of breakfast, to be honest, and unless your Tesco has a coffee machine, you’ll have to settle for a Starbucks iced coffee from the fridge. I was still really hungry after what I created for my breakfast. Lots of different salads but most of these aren’t in your meal deal, so if you want to keep it £3 you need to get some kind of a sandwich, like a prawn one, which is the lowest calorie option. You do have healthy fresh snacks if you don’t want crisps and chocolate, these are in the form of pre-chopped fruit, which you can obviously have for breakfast if you wanted. It’s got better, but it never really appeals as much as some other places. Packaging is the same old Healthy Living Tesco stuff so perhaps that’s why, and to be honest everything else is all brand options. M&S isn’t somewhere I do much shopping, because it’s a bit like ditching your Primark shopping for the equivalent of a designer clothes store – expensive. You do however have quite a nice selection of options, and lots of them are healthy, and actually look really appetising. I wasn’t really sure where to start, as even though they have nice looking sandwiches, I will always prefer a salad or something alternative. 4/5 – Really good selection, but can get carried away with calories and prices. As you can see this is by far the most calories I ate over breakfast and lunch. I was able to graze with some of the items which were nice, and they were very tasty, but again it was by far the most expensive out the lot. The range, however, was really good, particularly where breakfast is concerned, I would still give it a 4 because of this. Like I say, no hot food and drink, plus the price stops it from getting to a 5. I have always liked the M&S minimal packaging that has text and print that sort of shows, even if it’s not the healthiest, it is quality. You do have it marked if it is a healthier option with their ‘eat well’ range, but it is quite small and can be hard to see. I’ll be honest Greggs surprised me the most for doing decent coffee, having a great fresh healthy range and allowing my budget stretching so far! I used to think they just did bacon butties for the builders or sausage rolls for kids when they went into town, but it was a pleasant healthy discovery. I think the freshly prepared bit really won me over out of all of them, as only Pret a Manger does that, but that is always so expensive, and like Nero they charge to eat in, Greggs doesn’t. I’d maybe like some more chilled breakfast items, I do love a granola, and bircher muesli, so I reckon if they add another option they’d be winning me over every time. If you want to find out more about Greggs food content have a look at the following links for the nutritional content and the allergens. Previous Post CAN YOU DO UNIVERSAL STUDIOS HOLLYWOOD IN A DAY?